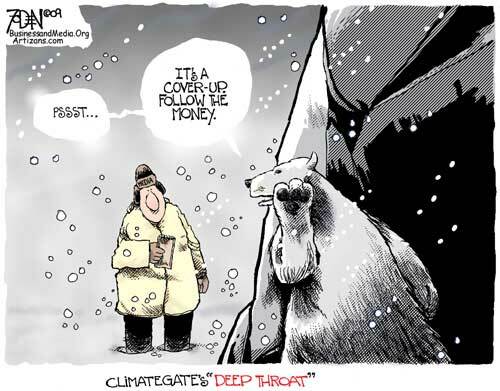 Finally, a list of the latest lies from the Global warming cult. The wheels continue to come off the “Climate Change” bus. The tree-ring data that Michael Mann used in his 2008 version of the hockey stick has a worse correlation to temperature than to atmospheric CO2. You can see the details here. Follow his links for more information. More recycled lies from the Global Warming Cult, trotted out just as the Dopenhagen party gets going. The images, taken in Hudson Bay, Canada, around 200 miles north of the town of Churchill, Manitoba, show a male polar bear carrying the bloodied head of a polar bear cub it has killed for food. Polar bears usually subsist on seals, which they hunt from a platform of sea ice. But the melting of sea ice as a result of rising global temperatures has made it more difficult for polar bears to hunt seals at sea, confining the bears to land. This has led to malnourishment and starvation as polar bears are unable to build sufficient fat reserves for winter. Drowning is also more common as bears are forced to swim further out to sea to find food. The images add to the evidence that polar bears are increasingly hunting each other for food in their desperation to survive. Manitoba Conservation normally receive one to two reports of bear cannibalisation annually, but scientists say they are aware of eight cases so far this year. Last month tourists on a guided tour of the area were reported to be distressed after witnessing a male bear eating a cub. The release of the images comes as world leaders gather in Copenhagen for the United Nations Climate Change Conference. Some other points: The polar bear population is growing, not declining. Arctic ice is growing, not melting. It’s cooling, not warming. 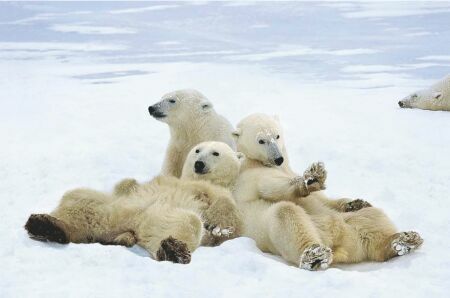 Polar bears have been known to swim non stop for a hundred miles without drowning. Eight sightings this year compared to an “average” of two per year is due to more polar bears, more tourists, taking more pictures, and getting more distressed. Get over it, it’s nature, and supposedly that is what you went out there to see.